Stay up to date with THP news and events by subscribing to our quarterly newsletter. On 20 June THP will attend the launch of the Knowledge Centre on Migration and Demography at the European Commission’s Joint Research Centre in Brussels. On the timely occasion of World Refugee Day, this event will bring together policy makers, analysts and researchers from the European Commission, other EU institutions, European and international organisations, think tanks and academia to launch the European Commission’s Knowledge Centre on Migration and Demography. The event shall underline the scope and aims of the Knowledge Centre to provide tangible, internally validated responses to these needs: on the one hand centralising, putting in context and making comparable the relevant knowledge while on the other distilling, qualifying and tailoring it to serve the different EU policies with the most appropriate information. In doing this, the knowledge centre will also contribute to identify existing knowledge gaps and areas requiring more focused research and studies. 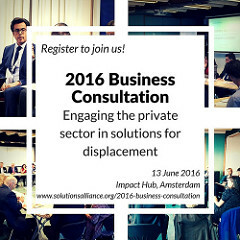 The United Nations Development Programme and the NGO SPARK, which develops higher education and entrepreneurship for youth in fragile contexts, as Co-Chairs of the Solutions Alliance Thematic Group on Engaging the Private Sector, will be organising a one-day Business Consultation in Amsterdam, the Netherlands, on 13 June 2016. Further develop concrete proposals around ‘LinkedIn’ groups on skills mobility for the displaced, ‘Business-in-a Box’ solutions for entrepreneurship, including through connections to value chains of larger companies, and digital remote work opportunities. iCON Group will hold a seminar on Immigration & the Impact on Corporate Culture & Inclusion: The need for corporate engagement, on 6 July 2016 in Central London. The aim of this conference will be to bridge the gap between business and migration through corporate case studies, expert led panel, workshops & audience driven conversation. See the iCON group website for more information, seminar agenda and registration.